I have to set the record straight. 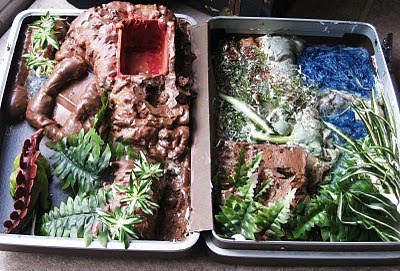 For any of you that thought I was so amazingly creative for thinking up my sons Dinosaur Land, I really wasn't. I borrowed the idea from my DAD, he is the genius behind the suitcase play-land. 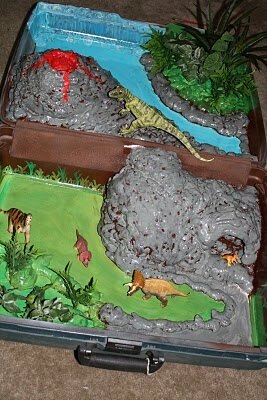 When I was little he created two suitcase play-lands for us kids. I wanted to share them with you to give you some more ideas of what can be done. WARNING these suitcases are really old. They've had over 25 YEARS of wear and tear. Pieces are missing, wallpaper is coming down and they are falling apart. Just envision what they once were. The first was built for our Cowboys and Indians. We had action figures of the Lone Ranger and such. This was the cowboys side. Of course they needed a jail. I always loved the bank with a "real" safe. This was the Indians side. My mom made little tepees and the corral used to have a fence around it. The second suitcase was our zoo. I don't know why but I alway loved that it had a bathroom. It would probably look better with some animals in it, but you get the idea. Here are a few of the suitcases readers sent me. Emily from The dabbler made THIS one. 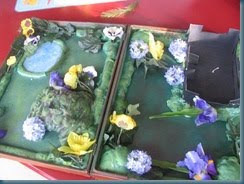 Ree from Boys and Joys made THIS fairy princess version after making a dino land. This one was made by Melissa at Those Alaskan Girls. Someone asked where I got my suitcase. I got mine at the local thrift store. I don't know if they always have them, but I only had to go to one store. I think these are adorable. I have seen suitcases a bunch at auctions too...and they usually go for next to nothing. Thanks for sharing such a fun idea! those are so cute! I don't think I could be that creative! These ideas are SO GREAT! Your dad rocks! he should start a craft blog@! THe details in the suitcases are amazing...i love them! These are so fantastic! My son would so love any of them. I may have to give it a try. I've left you a little bit of sunshine on my blog today. Please stop by and visit! Have a great weekend! I love all the suitcase ideas. They're a lot easier to store than a dollhouse or something. When my kids are older, I'm definitely going to be making some. Thanks for sharing! Holy crap! Your dad is amazing! The attention to detail... what an awesome gift he made for you. Your dad is my new hero, he was ahead of his time. I have ran out of time to get my finished by today, so I think I am going let my nephew help and work on it in a few weeks. These are amazing! How big are they? Awesome - love the ones your parents made, and that you have revived the idea. Love also that they can be closed up and packed away AND that they can be pretty much modified to suit any theme. I think I have my heart set on a zoo or farm or African Safari one. This is AWESOME!!! I'm a new follwer. I can't to see more ideas from you! Amazing!!! I just found yur blog from another blog, from another blog... I LOVE that your dad (and mom) made these for you as kids and that you still have them and they are in pretty darn good shape! and now you have revived the idea! Amazing!!! This is the neatest thing ,ever! I wish I had one as a kid. I would love if you shared this/or anything over at "Whatever Wednesday" on my blog!